LUGOGO – As the 2019 AFCON Qualifier between Uganda and Cape Verde edges closer, fans have been urged to follow the set guidelines by the security agencies, the stadium management as well as the FUFA International Match organizing committee. 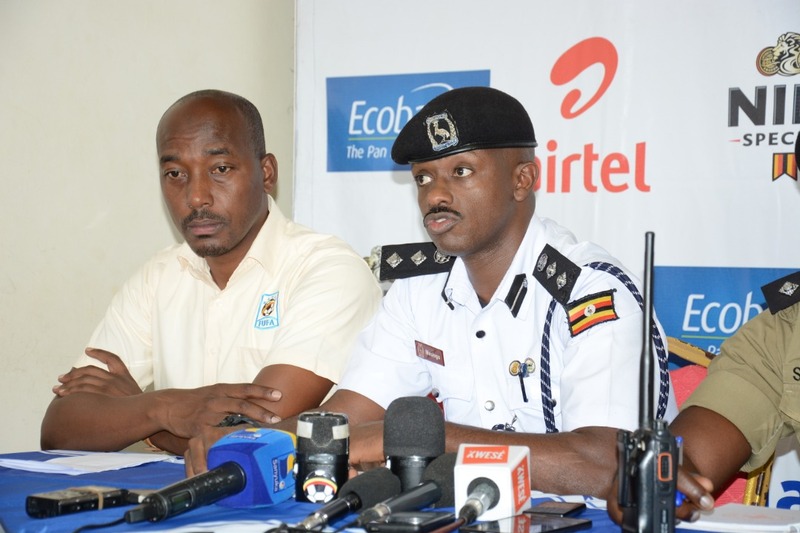 Addressing the media during a special press conference held at Lugogo on Wednesday, the Deputy RPC Kampala East Asp. Bashir Ssempala urged the fans to come on time and avoid the last minute rush and inconveniences. in the same vein, Asp. Ssempala advised fans to avoid wearing linen with political messages as well as avoid carrying eats and drinks in bottles to the stadium. “We expect a very big number of fans who are willing to come to cheer the Uganda Cranes, said Semapal. “I advise the fans to come on time and avoid the last minute rush. “Each fan will be screened outside the entrance of the stadium so we urge fans to comply with the set regulations. “Fans will not be allowed to jump to the stadium playing surface due to excitement. “There are cut off points at Jokas and Kireka to ensure easy movement and flow of traffic to the stadium, advised Musinga. “Jinja road to Kampala main route will be normal. From Wampewo round about to Kireka will be normal traffic flow. The Northern by-pass, Kinawata – Jinja Highway will also be normal traffic flow. The road will be blocked at Kireka and Jokas to make sure that the fans access the stadium with ease. VVIP’s will use the main gate with their stickers and park inside the stadium as directed by the traffic police officers on duty. The VIPS will access the stadium via the Namboole round about and park at the Namboole stadium lower parking. “Emergency vehicles that include ambulances, fire brigade and medical team will access the venue through the exit route. The general public is encouraged to use public transport (taxis, buses and the train) to avoid traffic congestion. Everyone is encourage to adhere to the set guidelines. Chairperson of the FUFA International Match Organizing Committee, Issa Magoola issued the travel itinerary for the match officials and the visiting delegation from Cape Verde. “The Cape Verde delegation has already confirmed to arrive in the country on Thursday, 15th November 2018 at 2 PM aboard Emirates Airlines, said Magoola. “They will be accommodated at Sheraton Kampala Hotel. The match officials from Tunisia also arrive on Thursday at 3 PM. “Uganda Cranes will be in action against Caper Verde in one of the most important games for the country, rallied Mandu. “The players need the full backing of the fans at all times. I therefore call upon the Ugandans to come up in big numbers and support the team. Uganda is currently on top of Group L with 10 points from their first four games. To secure a ticket to Cameroon next year, the Cranes need only a point from their last two games.